The Faery House, which will be located in the woods near the doll house, is coming along quite nicely. This is the upper level -- up in the treetop. 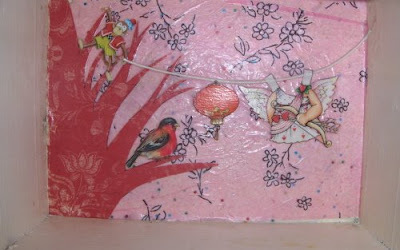 I have layers to add yet to make it seem more "in the clouds" and somehow I have to add a faery bed that will fit in. 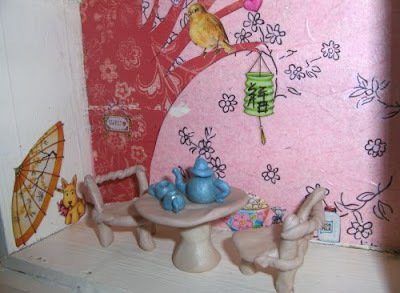 The lower floor houses a rustic Sculpey table and chairs set with teapot and cups -- also from baked Sculpey. I've pulled the little faery table out so that you might see all the food they've stashed underneath their tree. Faeries love a taste of human food sometimes. 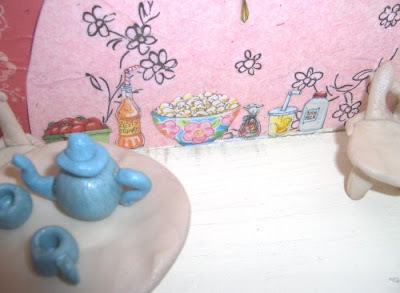 A lot of the embellishments came from old Mary Engelbreit paperdolls from her magazine. I LOVE her magazine, Home Companion. Will show you more as I go. Princess of the Universe will have so much fun with this! She has not seen this at all yet. Season's greetings from a miniaturist from Finland. Hi Lynn, Thank you for popping over to my blog. Nice to say Hello.. I just love how this is coming out, really cute.